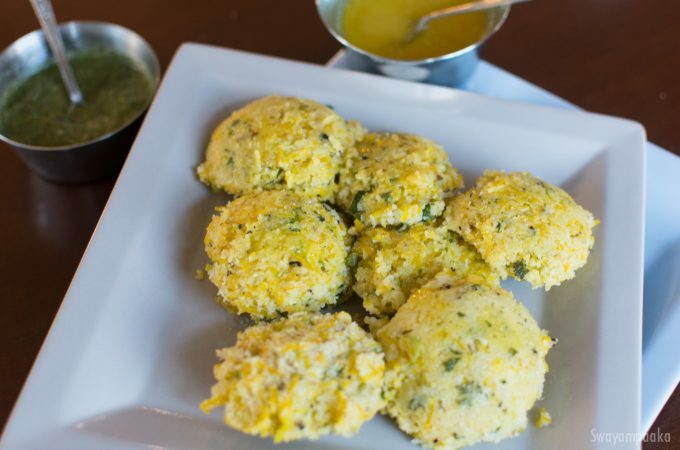 Sweet Pumpkin is in season now :) I have this super easy, gluten free and Vegan Spicy Pumpkin Idli recipe! I am using Japanese pumpkin or Kabocha , which is almost the same variety we get in India. It has strong flavor, fluffy texture and moist. I love this variety pumpkin compared to any of the winter or summer squashes. To name a few amazing benefits of super vegetable winter squash Sihi kumbalakayi or cheenikai, it is low calorie, high fiber, loaded with Vitamin A, Vitamin E and Vitamin C. Also a good source of B Complex, copper, potassium and copper as well. Easy spicy kadubu or Pumpkin Idli can be prepared in 30 to 40 minutes apart from soaking time. Try this Pumpkin sweet Kadubu and other pumpkin recipe – Pumpkin sambar.